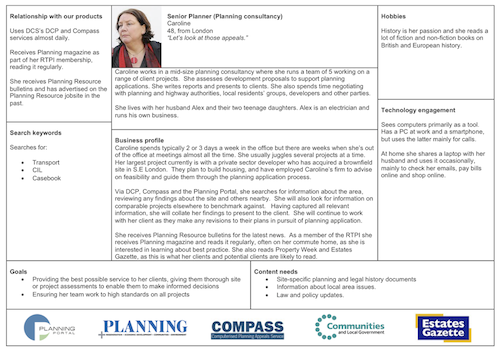 Over the past year I’ve been working on personas and managed to make them known around the company. But the thing is, we don’t use them to aid the design: they have been created primarily to present research findings and are now treated as a business tool. While our developers don’t really know them, all senior decision-makers do. And feeding user-centred design right into the heart of the company and using it to influence strategic decisions is always a good thing. It all has started rather innocently in November 2009 when we were running a huge online survey across over a dozen of our websites and interviewing over a hundred of our readers across all magazines. The standard market research somehow turned into something that resembled UX research: we decided to focus on our readers’ needs. We wanted to learn about their work, their goals and information sources. We asked what they did, how their typical day looked like, what kinds of information they needed to do their job and how they accessed it. We ended up with 136 telephone interview transcripts (in average 6 per magazine/website) and 7,365 online survey responses across all our websites (varying between couple of hundreds and couple of thousands per site). 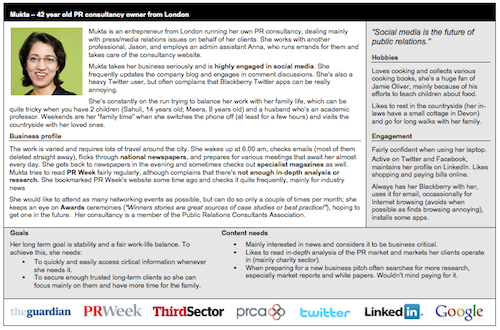 With that amount of information and that type of data what’s a better way to present the findings than personas? It’s a bit wordy, I know, but that was the plan – personas were meant to be research summaries after all and people were supposed to read them. And it’s still less text than in a standard written research document with tables and charts. To make personas more credible I had to do some extra background reading to learn about each market or to simply understand what people typically do at work. While working on a PR agency person was fairly easy, a wind technician, a charity’s finance director, a printing press dealer or a garden centre owner were a bit more difficult. The trial went quite well. So well, actually, that I had to prepare a “personas toolkit” that would be distributed across the company. It was a template of a persona and a short document explaining what personas are, why we use them, how they can be used and what kind of data supports them. As a result, since October personas are an official part of our big Market Development Planning process (it’s so big and important that capital letters are justified). There, alongside typical business KPIs and market information, they remind everyone about the audience and their needs. As everything else produced as a part of this process, they will be used to inform business and sales plans, to inspire new developments and to help us maintain focus on our readers. So, how do we use them, then? They are a part of our business planning pack which is distributed to all directors, and are there to inform the strategy and business development. They help senior people think about possible improvements to our sites. Head of Product Development actually keeps them on her desk all the time! They may be distributed across the sales teams. One publisher said she would send them to her editorial team so they could stay focused on their audience. Design team got interested and they may start using them as well. They already used them for user journeys. Sometimes they are used to facilitate team’s brainstorming sessions, although the session I attended didn’t really work – personas turned out to be a bit distracting (I may write about that at some point).